UNITED NATIONS, October 14, updated below -- With the Goldstone report on Gaza now coming back to life at the UN Human Rights Council in Geneva, at the Security Council in New York what passes for a debate began, on the Middle East and Goldstone. France, it was said, would "mention" the report, but it would "not be the thrust" of the Gallic prepared speech. Agence France Presse was chided for misreporting Israel's letter to the Secretary General and Council president, making an explosive complaint under Resolution 1701, but not (as AFP reported) asking for a Council meeting. One wag, a Netanyahu yahoo, opined that the Council should just call for a vote on referring the report to the International Criminal Court, and let the U.S. veto it. Another responded that maybe the U.S. might abstain, as China did when Darfur was referred to the ICC. The yahoo replied, even the Europeans might veto, since in his view by this logic NATO's acts in Afghanistan could be referred. But might the Taliban be a more serious military threat than Hamas? The yahoo noted that Israel's Permanent Representative to the UN, approaching the Council, was asked to show her UN identification card. "She doesn't come her much," he said, "if she's not even recognized." And still the Ambassadors poured in, including a representative of Sri Lanka. Their position may be of particular interest. Watch this space. Update of 10:29 a.m. -- on Goldstone, the speech of the UN's Lynn Pascoe, himself embroiled in controversy, click here then here, is essentially a defense of Secretary General Ban Ki-moon. "Members will recall that, at the beginning of this year, the Secretary General visited both Gaza and southern Israel... [he] hopes that the institutions of the UN and its Member States can reach a consensus on the way forward." He calls for domestic investigations. Update of 10:41 a.m. -- as Fatah's Malki speaks, the Libyan Ambassador whispers to Permanent Observer Riyad Mansour, who in turn taps on the shoulder of Riyad al-Malki, who stops and listens to the whisper. Update of 10:57 a.m. -- Israel's Ambassador Gabriela Shalev begins by saluting the UK's outgoing Permanent Representative, next head of M-6, John Sawers, wishing him good luck. Intelligence... Her written text, in its conclusion, calls debating the Goldstone report "a tale full of sound and fury, signifying nothing." And at 11:08 a.m., she said it. Update of 5:39 p.m. -- Iran's Ambassador, formerly in that country's film industry, is decrying "the Zionist regime" and urging the Security Council to defend its credibility. He rejects the "smears" of Israel, trying to divert attention from its own nuclear arsenal. Update of 6:13 p.m. -- For Sri Lanka, itself accused of war crimes in its war in the north this year, Ambassador Palitha Kohona says that Sri Lanka suffered under terrorism. "We have consistently endorsed the two state solution," he says -- in Palestine, that is. He says his government was concerned by events in Gaza, events which led to increase or tension and loss of civilian life. Is he referring to his own country? 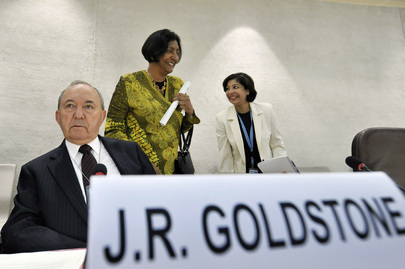 He looks forward to debate in the Human Rights Council, he says -- but not about Sri Lanka. Update past 7 p.m. -- it ended with a whimper, not a bang. Ambassadors streamed out of the Council chamber. Even Fatah's Al-Malki walked by the microphone without speaking. He slowed, he was tempted, but there were not journalists waiting there. Inner City Press stood by the stairs, asking if the Council president would come out to take a question. No, apparently. A reporter, already bundled up, asked, "so the lid is on." Yeah. The lid is on. UNITED NATIONS, May 13, updated -- On the UN's Gaza report, the Security Council on Wednesday responded with short “remarks to the press” by Vitaly Churkin of Russia, this month's Council president. See below. 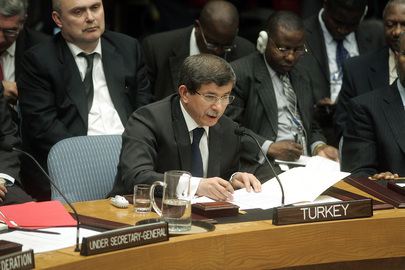 Moments before, the Ambassador of Libya, which proposed a resolution on the matter earlier this week, was heard to complain about Turkey's position. An Israeli diplomat told Inner City Press that the Council had no business in the issue, “this is between us and the Secretary General.” But as to the report, created with UN money, one wonders why member states cannot demand a copy of the full report from the Secretariat. Eventually, one guesses, it will simply be leaked. Here is what Churkin said, or read out loud from notes. Afterwards, he answered every press question by referring back to the statement, saying it conveyed all of Russia's views. Inner City Press asked, “What about Sri Lanka?” “We're discussing that,” he said, and went back into the Council. Libya's resolution is dead. Update of 5 p.m. -- the post mortem has it that while China and Viet Nam wanted action on the Gaza Report, the U.S., Austria and Uganda took the lead in counseling to give Ban Ki-moon ample time to do... anything he wants.